Acclaimed writer Kim Newman and director Sean Hogan (The Devil’s Business) talk to Virginie Sélavy about their exciting new project, the horror play The Hallowe’en Sessions. A group of mental patients gather for a therapy session to each recount the terrifying events that caused them to lose their minds. But is their mysterious therapist all she appears to be, and will her course of treatment prove to be kill or cure? 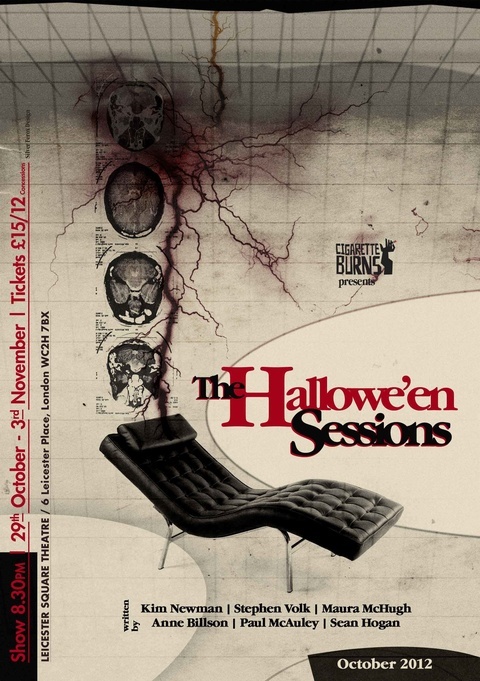 The Hallowe’en Sessions is presented by Cigarette Burns and an award-winning team of horror/fantasy creators. Writers Kim Newman (Anno Dracula, Moriarty: The Hound of the D’Urbervilles), Stephen Volk (The Awakening, Ghostwatch), Anne Billson (Suckers, Stiff Lips) Paul Mcauley (Fairyland, The Quiet War Trilogy) snd Maura Mchugh (Jennifer Wilde, Roisin Dubh) take you on a head trip through the darkest recesses of the human psyche, where no one – least of all the audience – escapes with their nerves or sanity intact. The Hallowe’en Sessions play at the Leicester Square Theatre from 29 October to 3 November. Tickets available from the Leicester Square Theatre website. Join the Facebook event. First broadcast on Resonance FM 104.4 on Friday 19 October 2012. For more info and formats to stream/download, visit www.archive.org.